Arthur Simpson - 'British to the core', but without a passport to prove it - lives in Athens, scraping by as a driver, journalist and petty thief. When Simpson spots Harper at the airport he recognises him as a tourist new to the city and in need of a private driver. But an ill-judged attempt to relieve Harper of his traveller's cheques reveals him to be a highly sophisticated criminal, and entangles Simpson in a complex double blackmail. Simpson becomes an unwilling member of an armed gang in Istanbul, tasked with driving a suspicious car across the border. 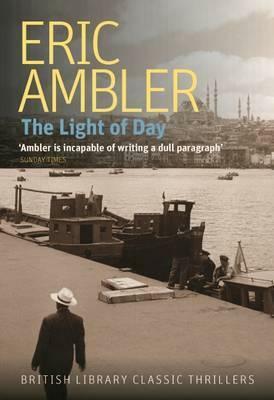 Soon he is an even less willing agent for the Turkish secret police, who suspect Harper of planning a coup - but his plans are far more audacious than that, and Simpson is in very deep water indeed.The Light of Day won the Edgar Award for best novel in 1964, and was the basis for the classic film Topkapi. Like much of Ambler's finest work, the novel focuses on an innocent man caught in a web of intrigue and deceit, and Simpson is one of the most memorable heroes in any classic thriller.